Winston-Salem, NC – Sunrise Technologies, a global provider of Microsoft Dynamics 365 Business Applications and Cloud services, announced today that FILA North America has selected Microsoft Dynamics 365 to run their business and Sunrise as their Dynamics 365 implementation partner. FILA North America, headquartered in Sparks, MD, is an iconic sportstyle brand that offers athletic and leisure footwear, apparel and accessories. The company has experienced success in reaching a new generation of consumers, through innovative collaborations and retail partnerships with Barneys New York, Urban Outfitters and Foot Locker. The company selected Microsoft Dynamics 365 for their cost-effective cloud ERP platform, combined with Sunrise’s apparel and footwear implementation experience. 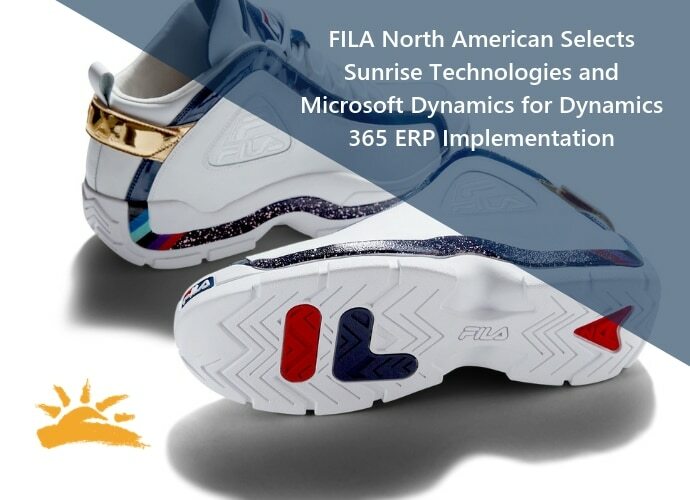 FILA North America will implement Microsoft Dynamics 365 for Finance and Operations and the Sunrise 365® Supply Chain Solution.